Picture of the Chalk Cliff, Birling Gap, East Sussex Birling Gap is a unique hamlet near Eastbourne, East Sussex, owned by the National Trust. There are steps down to the beach with fine views of the famous Seven Sisters in one direction and Beachy Head in the other. 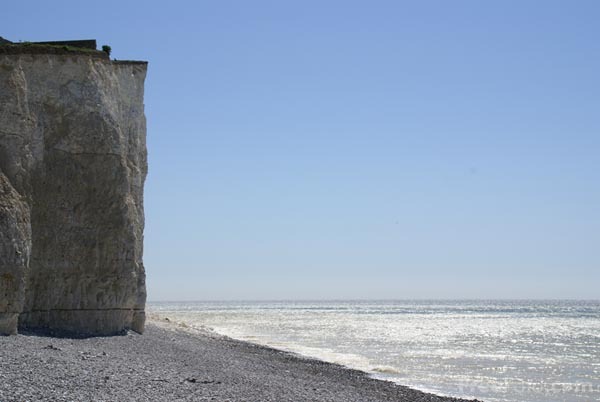 The chalky cliffs of the Seven Sisters developed under the sea, 70 to 100 million years ago. Later the chalk cliffs dipped beneath the sea again and came up covered in silt and sand, still visible as the top layer. VIEW: More images from the category Birling Gap, Seven Sisters and Beachy Head, East Sussex or taken at the same location or around the same time .